Airflow: It’s important to have proper airflow in the storage facility for two main reasons. First, to ensure that any harmful fumes aren’t stagnant in the area. And second, to aid in temperature and humidity control. Without proper ventilation and circulation, the fumes from the products can become trapped in the area and cause issues for both the staff and the product itself. So by using fume hoods, fans, and adhering to clean room standards, airflow can be properly maximized. Sunlight and Heat: Pharmaceutical products need to be manufactured and stored at proper temperatures. If the temperature is too hot or too cold, the batch can be deemed unusable. So this is why monitoring temperature and sunlight is so important. Any windows in the facility should be covered if they let in direct sunlight. And all products should be stored in proper packaging to protect the products from sunlight and heat. Sunlight and heat can cause serious damage to GMP synthesis products, making temperature monitoring crucial. Refrigeration: If products need to be stored in refrigerators or freezers, horizontal units are more efficient than vertical units. In vertical units, heat will still rise, making the bottom part the coldest. It’s important that products stored in refrigeration units are all stored at the same temperature. Additionally, if a storage facility has multiple refrigerators or freezers, the area should have sufficient air conditioning to combat the heat produced by the units. Fortunately, today’s technology can help GMP synthesis storage facilities to follow these important guidelines. 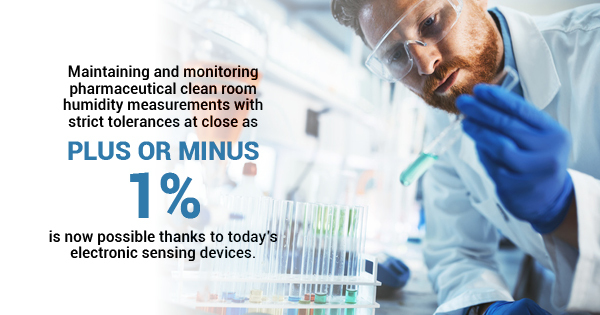 In fact, clean room humidity measurements can be maintained and monitored with strict tolerances as close as plus or minus 1% by using electronic sensing devices. So by adhering to these storage guidelines and investing in the proper services and technology, pharmaceutical manufacturers can ensure their products remain safe and ready to use. ← Why are GMP Regulations Important in Today’s Pharmaceutical Labs?